On 31st January, Hands Off Our Homes held our first “neighborhood” stop the Bedroom Tax meeting in Seacroft. Despite harsh wind and rain 20 people attended and were able to have their say and discuss ways forward. Many spoke of their personal situation and anger at the bedroom tax combined with council tax benefit cuts. Many also acknowledged that the way these cuts were being implemented was to split up communities but the only way we can fight back is together. Brian Selby, one of the local Labour councilors, also attended and spoke at the meeting and described the situation at the Civic Hall as “managing the impossible” and aside from knocking through a few walls and informing those affected there was little the council could do. Selby claimed that otherwise “the large man in London” (Eric Pickles) would take their power away. Many in the audience responded that the council should not take such a week position but stand up to the ConDem government and refuse to implement the cut that threatens to thousands way of life in Leeds. There was also the question of how Leeds City Council could claim that enforcing the bedroom tax would be the only way they could balance their budget when evictions cost £32,000. Selby did not respond to this point. Those at the meeting discussed alternative ways of dealing with the financial predicament that they face which including ideas such as teaming up with others in a street in order to prevent evictions. Looking for community action as opposed to individual attempts at a solution was clearly the preferred way forward. 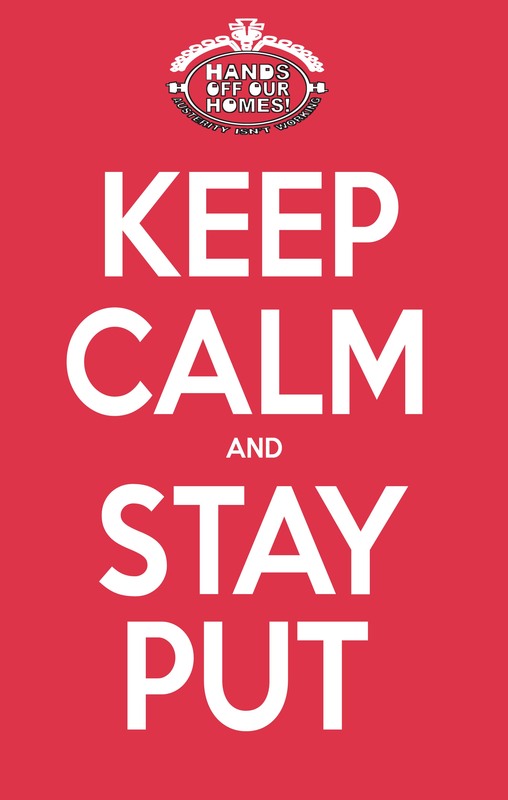 Quantities of leaflets were taken away for further distribution and the “Keep Calm and Stay Put” posters should, hopefully, soon be appearing in tenants’ windows across Seacroft. A few people from the meeting are getting involved to build the campaign in Seacroft. Today Seacroft , tomorrow Armley…….watch this space and contact us if you require help to set up a meeting in your area. Always remember – We are many, they are few.